PEACE OUTside Campus attended the monthly Domestic Violence Council meeting held by the Westchester Office for Women on Thursday, March 10, 2016 in White Plains. We got the opportunity to present our Foundation's mission and programs to representatives from various agencies across Westchester County, including: local police departments, Westchester County DA Office, Pace Women’s Justice Center, local colleges and community organizations providing direct services to victims of domestic violence. This was a great networking event, our programs and accomplishments were received with great interest and we are already collaborating with some of the like minded organizations in attendance. We would like to thank Robi Schlaff, Director of Westchester County Office for Women for this unique networking opportunity. POC receives funding from the Thomas and Agnes Carvel Foundation for a third year! 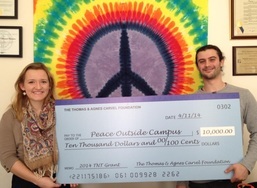 PEACE OUTside Campus is honored to announce it has received funding from the Thomas and Agnes Carvel Foundation for a third year! With this generous donation, we will be able to reach even more high school students with our Teens ‘N Transition presentation. Our hope is to spread our mission and Lindsey’s story to students in the tri-state area. We are very thankful to the Thomas and Agnes Carvel Foundation for once again believing in the work that we do! PEACE OUTside Campus was awarded a grant from Hitachi Metals America, Ltd. Community Action Committee based out of Purchase, NY. The Committee was established to support non for profit organizations that enhance the quality of the lives in the communities where they live and work. The support will help PEACE OUTside Campus reach even more students and their families with our message of safety. We offer our sincere appreciation to the Community Action Committee at Hitachi Metals America Ltd. for their support of our mission, as well making our community a better place to live and work. PEACE OUTside Campus, The Lindsey M. Bonistall Foundation is pleased to announce that Founder and Vice-Chair, Kathleen Cooney Bonistall, was honored at a celebration for Women’s History Month hosted by the Greater New York Chamber of Commerce. Hundreds of business and civic leaders came together for the breakfast and awards that were held on Friday, March 27 from 8:30 to 10:30 a.m. at the Hard Rock Café in Times Square. Honored for her work with PEACE OUTside Campus, The Lindsey M. Bonistall Foundation, Kathleen said “I am greatly humbled to have been selected by the Greater New York Chamber of Commerce for this honor. Since Lindsey’s death, I have been compelled to spread our message of safety so that no student or parent had to endure a similar tragedy." Kathleen was honored alongside Kerry Kennedy, President of Robert F. Kennedy Human Rights; Gale Brewer, Manhattan Borough President; Mwisa Chisunka, Ombuswomen NYS Tax & Finance; Ruthie Davis, President & Founder of RUTHIE DAVIS; Susan Lee, Founder of Camp Broadway and Karen Magee, President of NYSUT. Each of these women serve as role models for the significant impact they have had on their greater New York community. For more about the Greater New York Chamber of Commerce, visit their website. PEACE OUTside Campus is the proud recipient of a grant awarded by the Smart Family Foundation. We are excited to partner with them, given our shared interest in education, to spread our message of advocacy, empowerment, and security. We are appreciative to the Smart Family Foundation for its generous support which will allow us to reach more students and their families through our educational outreach program, Teens ‘N Transition. 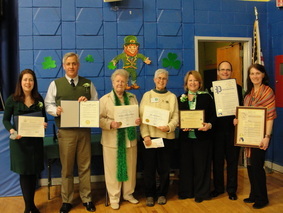 Hosted by the Woman's Club of White Plains, PEACE OUTside Campus, was selected the honoree and beneficiary of the Third Annual Corks & Forks event. The sold-out evening featured signature dishes from Westchester's finest restaurants, wine tasting, martini bar, and a silent auction. We are incredibly thankful to the Woman's Club for selecting us as the beneficiary of the evening and their generous gift to our Foundation. For more information about the Woman's Club of White Plains, visit their website. The Boucher Charitable Foundation of Harrison, New York awarded a grant to PEACE OUTside Campus. It was a true honor for our Foundation to be recognized for its efforts to support safety on and off college campuses in such a way. We are thankful for the support of the Boucher Charitable Foundation! PEACE OUTside Campus was honored to be the recipient of a grant awarded by The Thomas and Agnes Carvel Foundation in support of our Teens 'N Transition program. We are most grateful to The Thomas and Agnes Carvel Foundation for their generous grant and recognition of our Foundation's commitment to improving personal safety for college students. PEACE OUTside Campus, The Lindsey M. Bonistall Foundation was awarded the 2012 Monsignor Ed O'Brien Award for Community Service from the Sisters of Divine Compassion.